The new update brings a much anticipated feature that completely changes the way you use Windows. Microsoft is rolling out its semi-annual Windows update to Windows 10 PCs and tablets from Monday. This is the fifth such feature update since the first public launch of Windows 10 in 2015. The update was earlier called Microsoft Spring Creators Update, but it seems Microsoft wanted to simplify the name this time around. Furthermore, the new update that brings Windows 10 to version 1803 is focused on productivity and task management with some new, nifty features. While the update is called April 2018 update, it is arriving a bit late. It was scheduled to roll out a couple of weeks ago, but Microsoft took some time to even out a few bugs that were found at the last minute by beta testers. The easiest way to get the new update is to wait for the notifications. Windows Update will automatically inform users that a new feature update is ready to install. However, you can manually check for updates from the Settings app or get the latest version directly from Microsoft store. With the release of the new update, the Windows 10 Anniversary Update that released in 2016 is no longer supported. It will not receive bug fixes and security updates any more while the April 2017 Creators Update will no longer be supported from October 9 from this year. Users are hence recommended to update to the latest version soon as they receive it. Microsoft has made the update process more streamlined so that users don’t have to spend hours waiting for the update to finish. Features will download in the background once the initial changes are done after a Windows restart. The new update brings to the table some much anticipated features that is likely going to change the way users have used Windows. This includes the new Timeline feature while Microsoft’s new Fluent design language has spread to more places. You’ll see more hover effects in places like the Start Menu and the Notification Center apart from the Settings app while the taskbar can now be blurred. The major new feature in the new update is the Timeline. The feature sits in place of the Task View button beside the Cortana seach bar on the Task Bar. The feature lets you see all the apps and activities of the past 30 days so that you can pick up right where you left off. The apps and activities sync across various machines including Android and iOS devices running Microsoft Edge various, in which case, the entire browsing history on smartphones will be available on Windows. The Timeline can also be accessed by pressing Windows Key + Tab or swipe up with four fingers on the trackpad. The Timeline still shows the active apps but a scroll bar on the right allows you to access apps, documents, Office programs, web pages opened using Microsoft Edge. If you are privacy freak, however, the feature can be turned off by heading to Settings —> Privacy — > Activity History where you’ll find two check boxes to either turn off activity history for current PC or disable the feature altogether. What’s Do-not-Disturb for Android is Focus Assist on Windows. The update brings the feature that allows users to be more productive by muting notifications. Earlier, the feature was known as Quiet Hours but now Focus Assist will automatically mute notifications when you’re playing a game or projecting a presentation. You can allow some apps to show notifications though, by tweaking the settings. Focus Assists sits in the Activity Center in the Task Bar. Once again, the feature is lifted from MacOS devices that allow file sharing between nearby machines. Nearby Share will allow users to share photos, videos, documents, web pages across nearby Windows 10 machines. The receiving party needs to have the update installed to use it and it works over Bluetooth much like Apple’s AirDrop. The feature is disabled by default but you can turn it on by going to Settings —>System — > Shared Experiences. There are options to either share with only your devices or share with everyone nearby. The feature does not support sharing via contacts though, which we hope Microsoft will soon add to it. Pairing Bluetooth devices have always been a long process, but with the new update, that’s about to change. Windows will now send an automatic prompt to quickly connect to a Bluetooth device nearby and pair with it. It isn’t supported by all Bluetooth devices though and device makers will need to add support for the feature to quickly pair them with the PC. Microsoft’s Edge browser will finally have the ability to mute tabs to prevent unwanted sounds from playing from a tab. The feature already exists in rival browsers like Chrome and Firefox. After the update, you can mute websites by right clicking on the tab and selecting ‘Mute’. Additionally, the browser also supports Progressive Web Apps that are essentially apps that are made for the web and is compatible across iOS, Android and Windows devices uniformly. Windows’ ability to allow dictation is not new. There have been multiple tools for dictation on Windows over the years, but users had to rummage for it. With the new update, Windows is making it easier for users to dictate speech to the PC to convert to text. Dictation mode can be turned on by simply pressing the Windows Key + H shortcut which will use the available microphones to understand what you’re saying. The feature works quite all right if you have a clear accent and good mics. Most high-end Windows laptops come with the option to switch between on-board and dedicated GPUs and Windows will offer users the make the switch on a per-app basis. So, you can choose lightweight apps like Chrome and Paint to run on the on-board graphics to save power, but Photoshop and games can be set to run on dedicated graphics to improve the performance. Previously, this was done automatically which was also quite efficient, but with the new update, Windows is giving the power in your hands. There are dozens of other new additions to Windows that ultimately help in making the platform more streamlined. 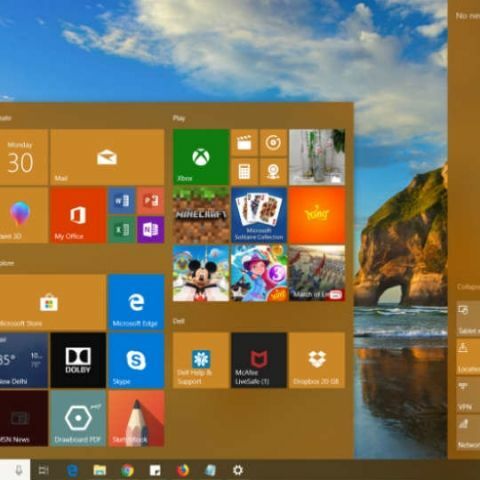 Windows is now the most popular PC operating system with over 1.25 billion PCs active over the world and with every update, Microsoft is making Windows more useful and more streamlined. The new features add to an already existing suite of productivity-centric features that will only make the experience better. Let us know what you think about the features.